What are your reasons for preferring Avatar: The Last Airbender rather than Avatar: The Legend of Korra ou vice versa? * -In Lok's defence, it's only had one season consisting of only 12 episodes out so far, but I did feel a lack of character development through it. Oh well. We'll give it time. I just like the characters better, and I like how in almost every episode they are in a new place. It makes plus ideas happen. The Last Airbender is currently par far a better series than TLK. This is partly due to the limited number of episodes TLK has under her belt. If we look closer at both series though, there are significant things that have been "lost" in TLK that TLA had going for it. 1) TLA was a "new" idea on it's own - bending was strange and new to TV and brought it's own magic to the series itself. Developing bending continued throughout the series right up until the very end. 2) Ang was simply the best "good guy" there could ever be! He met his challenges with an honesty that few characters ever develop. He was always open to having fun, meeting new people (even those that were sworn to harm him), believing in the best in people no matter how awful they where. 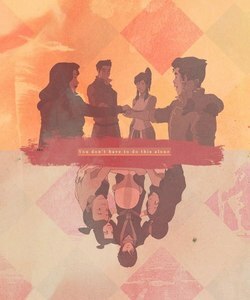 Korra is waaaaay to polar from Ang to capture any of that magic. 3) The cast were not just background fodder for the main character (Like it seems in TLK). They each had rich stories and valid reasons for their actions throughout the storyline, including the cabbage merchant! TLK lacks this at this point, though I am appreciating that they are trying to give us that and it takes time. 4) TLA world was rich with different lands and locations in almost every episode. TLK at this point is very stale with the "city life". 5) TLK seems like it's still reaching for what it wants to be, while TLA had the direction from the start of the series. 6) They should have started further away from Ang's time to avoid bitterness (yes I am a little bitter) that they killed off an amazing character! I know that for the saga of the Avatar to continue each must leave the world behind, but Ang was just too close to accueil to have him be literally replaced par Korra. I think I would have liked Korra plus if I knew she wasn't the direct successor to Ang. There is more, I'm just tired and need sleep now. Whatever. People like what they like but they don't have to be vaginas about it and hate on the legend of korra just because it's different. It's like, how ungreatful can toi get? Did anyone on here indicate that they "hated" The Legend of Korra? No. Because I wasn't talking about here specifically. I've seen a lot of rude stuff on Youtube and i'm sure there are some on this website also. Well, I like LoK, but I CAN see why some fans of TLA hate it. It isn't as good, in my opinion... but I get the feeling it'll get better. Because Korra mastered 3 elements already, no fair. Aang needs to master the other 3 elements. That's my first reason. My seconde reason, I l’amour Aang he's so cute!!!!!!! I prefer A:TLA, but LoK is great too. A:TLA just has so much going for it.